I’m really excited to share my latest one-pan recipe, Skillet Stuffed Bell Peppers. It is unbelievably tasty, and everything cooks in the same skillet. Even the rice! Skillet Stuffed Bell Peppers have all the incredible flavor of traditional stuffed bell peppers, but the prep and clean up is a snap. If your family loves stuffed bell peppers, they are going to love these Skillet Stuffed Bell Peppers. My One-Pan Chicken Alfredo and One-Pan Cheeseburger Casserole have been getting rave reviews, and I know you guys are going to love this recipe too! Looks good! Can’t wait to try it!!! 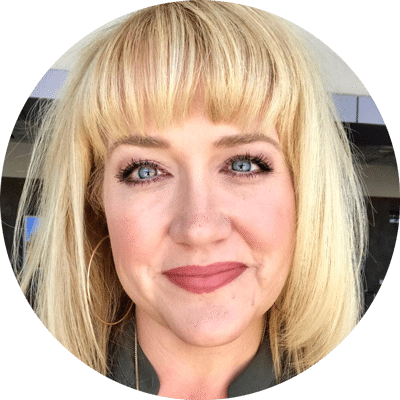 Stopping by from Jillee’s site. Now that looks good! I like stuffed peppers, this is a bit more user friendly. 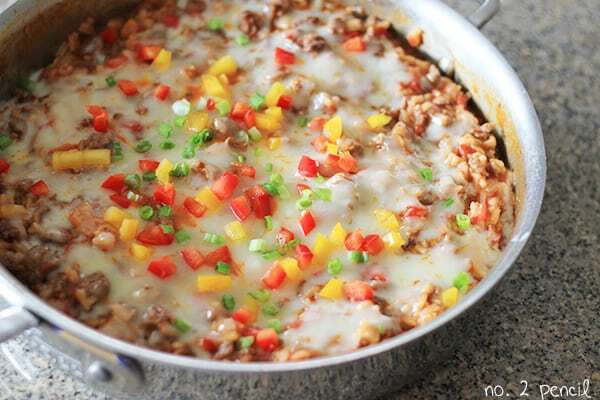 This looks so yummy and I love that it only uses one skillet! Will be trying this out soon!! 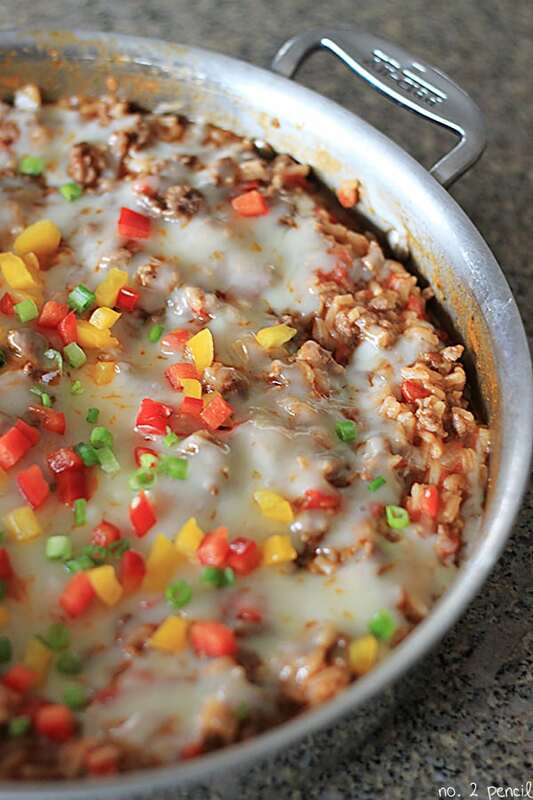 One pan recipes are the best! 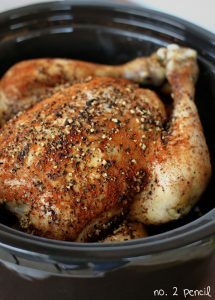 I can’t wait to make this for dinner this week! 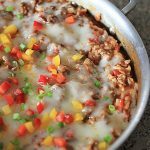 OH wow love this one pan meal… I sometimes hate stuffing peppers and the long tedious process I have to go through–love that you made this into a one-pot meal. This sounds amazing. I love stuffed peppers but it is a lot of work. The peppers are coming in now and we have a TON. I have 11 c. diced in the freezer already and a dozen or so peppers to dice in the fridge right now. Do you think this would freeze well? 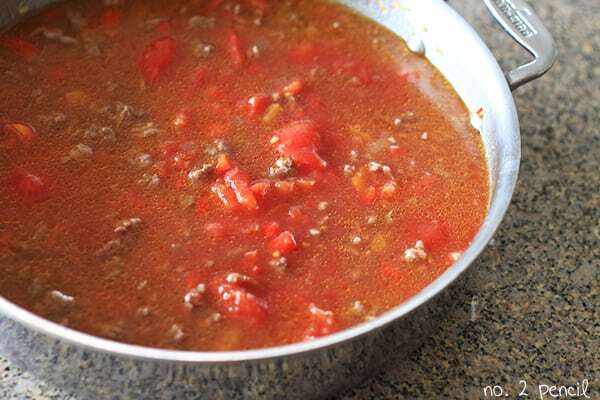 I am thinking it would be great to make up a huge batch of this and freeze in single meal size containers for my husband’s lunches or even as a casserole and just reheat in the oven. Will be trying this out soon. So smart to freeze your peppers! I think this will freeze wonderfully. Great idea! I tried this recipe for lunch today and I am eating it as I type this! I can’t believe how delicious this is. I think the cheese really adds a wonderful level to it. (I used my favorite triple cheddar blend). It is easy to make and my house smelt great while it was simmering. I was able to use fresh peppers and onion from our garden, making it just that much better. This will definitely be added into our rotation to use up all those diced peppers in the freezer (now up to 30+ cups diced in there!). I didn’t have any soy sauce so I used Worcestershire and subbed the whole tomatoes for crushed tomatoes, since that is what I had on hand (plus I have some really anti-tomato chunk eaters). I was going to try and freeze some of this right away, but after tasting it, I think I want to leave it in the fridge for leftovers for lunches. Thanks again for this recipe and I look forward to trying some of your other recipes. I was planning on making this for dinner, but my usual recipe got deleted. Thankfully I found yours, because it sounds so much better!! I’m pretty sure I was drooling while reading it…. I’m so glad! I hope you loved it! Do you use instant rice? Also, could I use brown rice? Thanks! This recipe calls for uncooked extra long grain white rice, not instant rice. Brown rice would take much longer to cook, but you may be able to experiment with par cooked brown rice. The liquid ratios and cooking times would have to be adjusted. I just made this today and loved it!! It was full of flavor and only had to get 1 pan dirty! Thanks soo much for the recipe I will definitely make it again! I just made this for me and my Dad, perfect bachelor food thank you! I have made this twice. I’m not a huge fan of cooked tomatoes so both times I have used petite diced tomatoes. I also use garlic powder instead of garlic cloves. Other than that I follow the recipe exactly. It is amazing. My husband rates it a 10/10. It is definitely one of our favorite meals. We love it! Hello, this dish is delish. Made it just hours ago for the husband and I, very pleased. He sure seemed to like it. He’s a picky eater so when I told him I was making stuffed bell peppers he told me he didn’t want any and to please make something different. I was a bit in a bind, I bought the ingredients had the beef thawed, ready to go. Googled stuffed bell pepper deconstructed and found myself here, he couldn’t even tell it was basically the same thing just different form. So yummy, thanks! 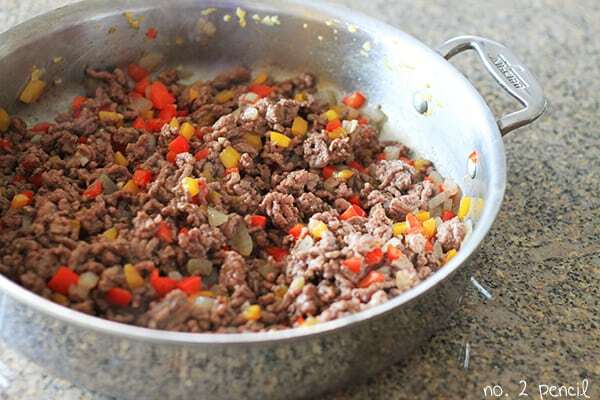 I’m making this dish because I have some ground turkey to use up, but my SO doesn’t really care for it–this dish is so flavorful he thinks it’s ground beef! 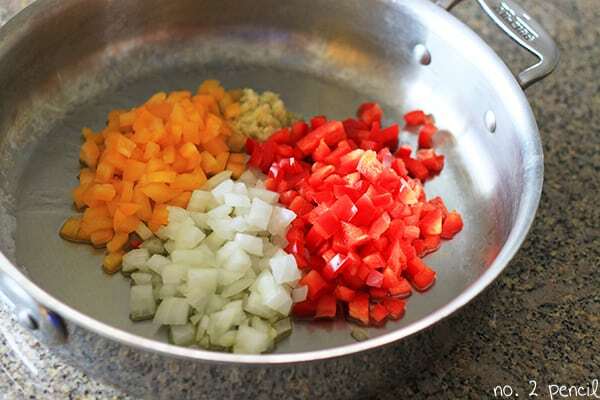 I use flash-frozen diced bell peppers when I have them (lay them on a cookie sheet to freeze solid for a couple hours, then put in a freezer bag to store.) I had a bunch, and knew this would be perfect to use them all up. 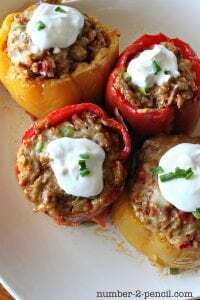 This is a quick, delicious meal that reminds me of the more time consuming stuffed peppers my momma used to make. I make this all the time! Thank you so much for sharing this recipe. Its easy, fast, nutritious and everyone loves it! This recipe was a big hit!!! 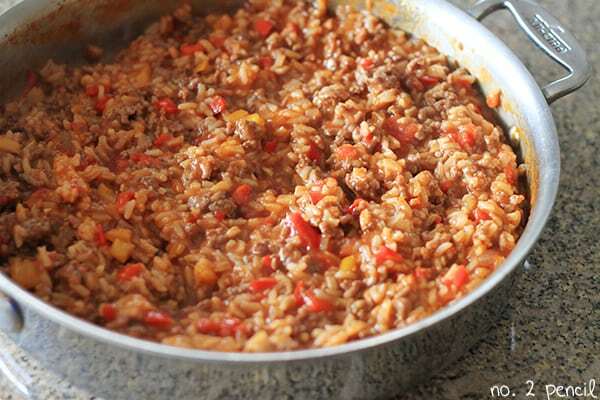 I substituted ground turkey and used parboiled brown rice and it turned out amazing !! I also can’t get Jack Cheese here, so I used Provolone which turned out perfect. I love that it’s all made in one deep skillet. This is definitely a keeper recipe. Even better than actual stuffed peppers. This recipe looks good! 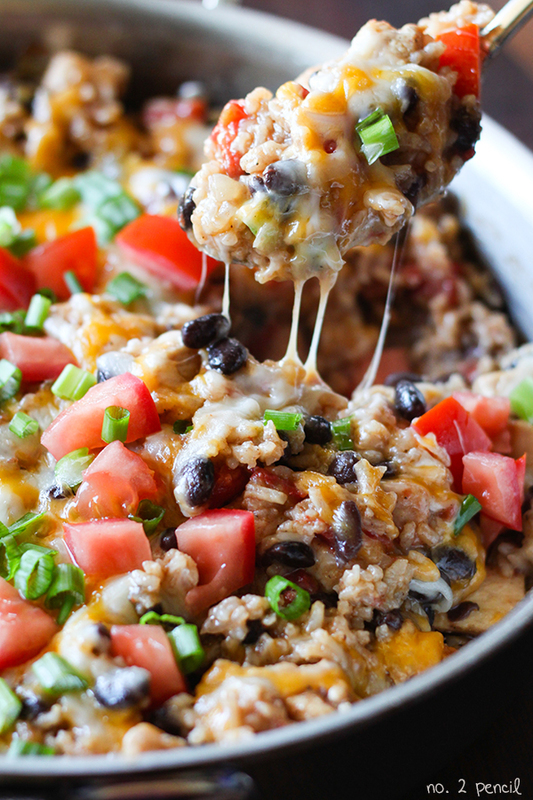 If it is anywhere near as good as your one pan Chicken Burrito bowl dish….it will be a hit here! This recipe is one of my favorites! So tasty!